Men·she·vik (men(t)-shə-ˌvik, -ˌvēk), n. pl. –viks, -vik·I, (in Russia) a member of the Social Democratic party in opposition to the Bolsheviks and advocating gradual development of full socialism through parlimentary government and cooperation with bourgeois parties: absorbed into the Communist party formed in 1918. So here we were, going along all smooth and easy with our 30 days, 30 words challenge until today, Day 16: Menshevik. I knew after so many amazing words to work with, I was going to bibliomance a tricky one sooner or later. But the rule is no do-overs. The word picked is the word picked and you have to do something with it. I’ve held myself to that since Day 1 of the dictionary project. It’s funny because just today I was talking with students in class about history. We were discussing the advantages and disadvantages of showing (or utilizing sensory description) and telling (or exposition) in writing. We were naming different disadvantages of using exposition exclusively, one of which is the danger of being too cut and dry and thus boring. I used history books as an example. “What are most history books made of?” I asked. “Telling,” they responded. I said yes, most history books are comprised of exposition and that is exactly why I thought history was boring as hell in high school. It’s why, I’m sad to admit, I didn’t take a single history class in college. 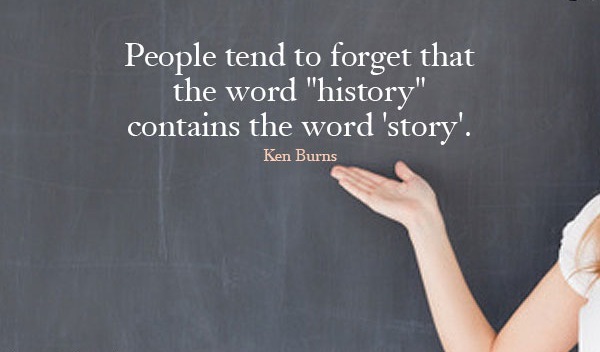 It wasn’t that I didn’t like history, it was that I had never been made to care about history, at least when it was labeled that. I always had a hard time with straight memorization. I had no interest in learning names and dates with no context. One of the stupidest things I had to do for history class was to memorize all the U.S. presidents’ names in the order they served. I would have much preferred to spend time learning a little bit about some of them then to spend all that time putting these random names in order. The people on the pages of my history books were flat characters at best and stereotypes at worst. Why should I invest in situations that happened long ago to people who I knew nothing about? I learned more about history in my other classes, where history was made relevant for me. Like in my high school religion class where we watched Gandhi with Ben Kingsley and Romero with Raul Julia. We learned about the movements these men started, movements rooted in compassion for their fellow human beings. In Mrs. A’s religion class, we talked about real people and the injustices done to them. We talked about the ability of individuals and communities to reach out with compassion and nonviolent resistance and to make a difference. One day, we had a special guest. Mrs. A brought in her son Matthew, who was fourteen, in a wheelchair, and had severe developmental disabilities. She told us that at the orphanage, he was in a crib alone and had begun to curl up in the fetal position. None of the staff there had held him for long periods of time and when the doctor examined him, he said that the little baby boy had begun the process of dying, his organs were beginning to shut down. Infants not only need milk to survive; they cannot survive without human contact. Without touch, they fail to thrive. I learned about history in my English classes where we read The Power and the Glory and Edith Hamilton’s Mythology and Les Miserables and Beowulf. We read Shakespeare and The Color Purple and The Adventures of Huckleberry Finn and Their Eyes Were Watching God. We read about different kinds of people from different places, all of whom were facing struggles in life, all of whom were battling with moral quandaries. We talked about them as if they were real people and we wrote about what their stories meant, why their stories were important. One day, in my English class with Mrs. T., she brought in a small boombox. The night before, a legendary sports figure in New Orleans had killed himself by inserting a tube from the tailpipe of his car into the nearly closed window and letting the car engine run as he sat inside. She played us two Simon and Garfunkel songs: “A Most Peculiar Man” and “I Am A Rock.” Simon and Garfunkel sing, “I have my books/And my poetry to protect me/ I am shielded in my armor/Hiding in my room, safe within my womb/I touch no one and no one touches me/I am a rock, I am an island/And a rock feels no pain/And an island never cries.” After the last song finished, she turned to us, her eyes wet, and asked us, please, to not be rocks or islands onto ourselves. It was clear that other people’s lives mattered to her, that we mattered to her. I’m sure that her class and her teaching is one of the reasons that I bring in current events–the ones that stir us, that remind us of both the beauty and fragility of being human–into the writing classroom for discussion. Because history is happening all around us. Because I want my students’ ideas and feelings to be part of that conversation. I don’t know much about this particular portion of history: the Mensheviks and the Bolsheviks. I won’t pretend that I do, or that a quick look at Wikipedia will give me the information I need to write with any authority about it. I am grateful that I came to history on my own over time. I’m grateful that I now have a deep desire to learn about history, because I realize that history is simply the stories of people. People who are trying to live their lives in an imperfect world. People who disagree with one another. People who suffer deeply and sometimes act out from this suffering. People who just want to be able to feed themselves and their families. People who want to create art and language and music. People who want to discover why the planets move the way do or create inventions to make life better for all humans. People who are passionate about so many different things. People who have their own stories to make and their own stories to tell.